Western Digital on Monday officially launched its first consumer SSDs based on its 64-layer 3D NAND memory. The new drives will be available under the WD Blue 3D NAND SATA SSD and SanDisk Ultra 3D SSD brands and will feature the same controllers, the same capacity points and the same level of performance that one might expect from SATA drives. Western Digital cites reliability and endurance as important selling points of the new SSDs. After Western Digital acquired SanDisk, it not only got its own NAND flash manufacturing capacities and became one the most diverse suppliers of storage devices, but also obtained multiple product lineups as well as renowned brands. This is where Western Digital ran into its first dilemma. On the one hand, Western Digital needs to promote its own trademark, after all, it is one of two vertically integrated companies in the world that can produce both HDD and SSD products. On the other hand, SanDisk is one of the very well-known suppliers of NAND flash-based devices (including removable storage and SSDs) and many customers trust this brand. Therefore, Western Digital just cannot cease using the trademark and write down millions in goodwill. Meanwhile, to keep SanDisk products competitive, it has to constantly release new devices under the name and this is where Western Digital ran into its second dilemma. On the one hand, it can keep developing different product lines for both brands, which would mean additional R&D and manufacturing costs, as well as internal competition, but which would further diversify its product lineup. On the other hand, it can unify development of certain product families and then just sell the same products under different brands. 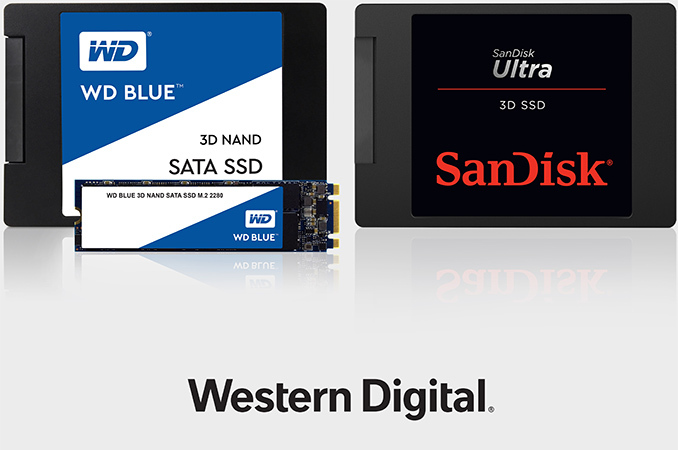 Only time will tell what Western Digital will do with its higher-end and enterprise SanDisk product families, but when it comes to entry-level consumer SSDs, Western Digital decided to go with releasing similar/identical products under the two brands. Such approach makes a lot of sense from the costs standpoint: there is a cut-throat competition on the market of inexpensive SSDs because it is gradually expanding and there are way too many contenders (at least so far) that compete by offering attractive prices of their products, so such strategy makes sense there. Given the approach just mentioned, the new WD Blue 3D NAND SATA and the SanDisk Ultra 3D drives share not only 64-layer 3D TLC NAND memory chips, but also a Marvell controller (presumably, the 88S1074 or the 88NV1120) with some additional engineering and in-house developed firmware. Both aforementioned ICs support Marvell's third-gen LDPC-based ECC technology, but the 88NV1120 does not require any DRAM cache to work, lowering BOM of the drives. Western Digital has not confirmed the exact controller it uses, but all modern Marvell SSD ICs support LDPC. The new products will be available in 250 GB, 500 GB, 1 TB and 2 TB configurations, but in different form-factors: 2.5"/7mm and M.2-2280 for the WD Blue 3D NAND SATA SSDs as well as 2.5"/7mm for the SanDisk Ultra 3D SSDs. As for performance, we are talking about up to 560 MB/s sequential read speed and up to 532 MB/s sequential write speed, which is in line with what other consumer-class SATA drives offer nowadays. Since we are dealing with 3D TLC memory here, the firmware uses pseudo-SLC cache to boost write speed, so, write speeds are bursty, depending on how full the cache is. As for random reads and writes, we are looking at 95K IOPS and 84K IOPS, respectively, which is comparable to other mainstream SSDs with the same interface. Western Digital rates its 3D TLC NAND-based drives for 1.75 million hours MTBF, which is higher than their drives featuring planar TLC memory, but a bit lower than the MTBF number offered by some competing devices. When it comes to total write ratings, Western Digital also seems to be conservative with its 100 TBW for the 250 GB model, 200 TBW for the 500 GB configuration and so on, even in comparison with ADATA’s SU700. Since the new WD Blue 3D NAND SATA and SanDisk Ultra 3D are Western Digital's first mass market client drives featuring 64-layer 3D TLC NAND chips, it is not surprising that the company decided to go with SATA and moderate reliability/endurance ratings. The firm needs to understand what to expect from mass-production 64-layer 3D TLC NAND on the SSD side of things, which is why it does not want to make big promises. 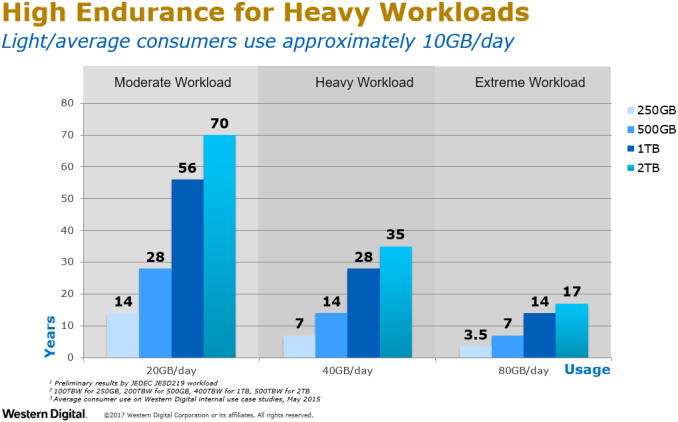 Meanwhile, Western Digital claims in its materials for press that average consumers write about 10 GB of data per day and therefore asserts that its WD Blue 3D NAND SATA and SanDisk Ultra 3D drives will last for years even under heavy workloads. Western Digital is not very specific about pricing of the drives. 250 GB versions of the WD Blue 3D NAND SATA and SanDisk Ultra 3D SSDs will cost $99.99 (all form-factors) when they are available in Q3 2017, but the manufacturer does not say a word about MSRPs for other configurations.